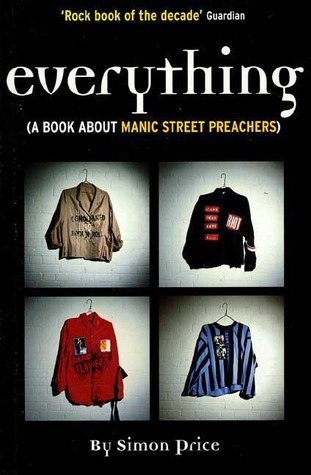 Everything (A Book About Manic Street Preachers) By Simon Price Review! Everything (A Book About Manic Street Preachers) (1999) by Simon Price is a stunning insight into the lives and careers of the Manic Street Preachers from their early days up to the time the book was published. The book gives a glimpse into their working-class beginnings from Blackwood in Wales during the time of the miner’s strike. Been from a working-class background myself I could understand the aspiration to want to get out of a small town and just do something with your life and music was their way out of the town which Richey described as “a shithole, where the only way to escape was to create your own reality.” The book describes their early days as a band when they would send their music for the attention of A & R departments in London and ask talent scouts to come to see them perform in the local pub and their earlier life as a band when they signed to Damaged Goods and Hevenly and their more long-term signing to independent PR and management company Philip Hall’s Hall Or Nothing which he had founded in 1985 through to their mainstream success and Brit Award wins. The part in the book about the disappearance of Richey Edwards was written with great compassion unlike a certain documentary called ‘The Vanishing of Richey Manic’ which the writer regrets been involved with stating that he had “entered into the project in good faith, swayed largely by the fact that Steve Lamacq, whom I trusted, was also involved.” Having seen the documentary I can say that I didn’t think he said anything wrong. The problem more lay in the vision of the entire piece and so many other commentators on the show. And the part in the book is also very fair by having various differing opinions on what people think happened to Richey about whether he is still alive or whether he passed on and has a lovely dedication at the beginning to Richey, “This book is dedicated to Richey Edwards, wherever he may be” with below it, “Our romance is having total power because we know we have nothing to lose. We’re secure in the knowledge that we already lost a long time ago”. I love Simon Price’s style of writing. I read a lot of books where the style is very objective and it’s so dull and so boring that the person, band or subject might be interesting but by the time they are through the overview or something I’m ready to fall asleep. This book was different. It was written amazing but it was also written with a human quality unlike some writer rattling off facts all the time and not injecting a bit of a style/personality to proceedings. It was very obvious that he was a fan as well as a journalist who had interviewed them over the years. I loved the bit when he spoke about a scene which didn’t make the band’s ‘You Love Us’ music video which Price was there for, “Nor did a shot involving Richey looking unspeakably gorgeous in a white wedding dress, a hand grenade stuffed in his mouth like an apple. I would have married him there and then.” It was just wonderfully down-to-earth and I think we’ve all looked at someone we fancy looking all manner of hot and thought that so it was very relateable and yes I could relate to it! Alongside the eleven chapters there is ten essays analysing various aspects to do with the band including their sexuality, fans and the fan culture, self-harm, Welsh nationalism, their feelings about been a rock ‘n’ roll band and America and their relation to the band. It is an intriguing, indepth book that you will just get lost in. It is really interesting and a thoroughly, thoroughly good read.